“Laugh about it, cry about it, but a job is a job”. But is it really, and at what cost of personal credibility and supply of #alternativefacts does one maintain a job with questionable ethics? 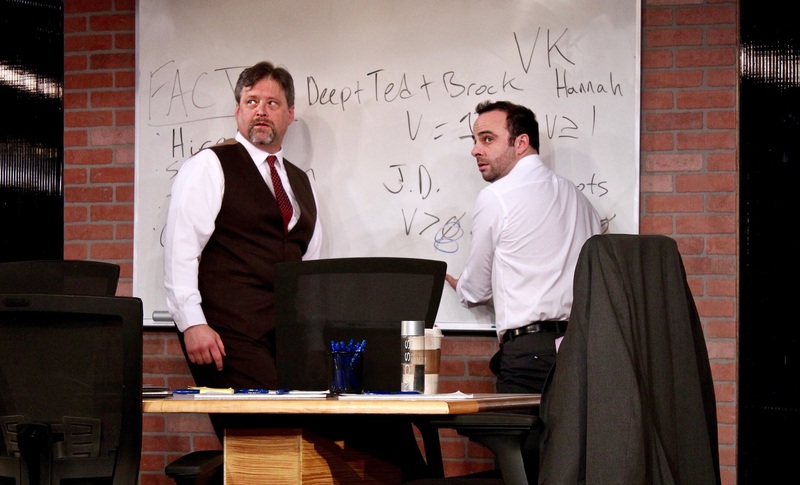 In “Ideation”, playwright Aaron Loeb addresses the issue of morality and ethics, through a group of corporate consultants working together on a mysterious, exciting, well paying, and ethically ambiguous project. Hannah (Lisa Mallette) is the in-house corporate executive and most senior member in the room. Her job is to facilitate and drive the project but more in a conciliatory manner than by controlling. She is joined by external consultants, Brock (George Psarras), Ted (Tom Gough), Sandeep (Sunny Moza). Additionally Scooter (Max Tachis) is a young intern, pushed by Hannah’s boss JD to do odd jobs like take notes, get coffee, get required supplies and get the room ready. While extremely short dead line creates some serious pressure, super secret hush-hush project with obscure mission about disposal of dead bodies lands the group into giant quagmire of ethical dilemmas. As the group questions the morality of the tasks, goal, and strategy, suspicions emerges about who might be in charge of the project, could there be several such projects, could each team be privy to only limited amount of information, and who would bear moral responsibility for such a mission. The paranoia quickly escalates to break down the team, as the members begin questioning who in the team has how much information and who could be a plant from the top and the ethical dilemma begins causing cognitive dissonance regarding their role in the entire affair. Directed by Mark Anderson Phillips, the play is thought-provoking, devilishly dark, and infuriating (because most of the answers never come), but also funny. In Trump era, marked by secrets and lies, it is also very timely. The interesting and thought provoking idea is that when a head honcho, someone at the top of the food chain refuses to be transparent and share the vision and properly considered tactical steps then there is a cascading feeling of paranoia and eventual breakdown in the team. Several times the team decides to stick to the project at hand and adhere to logic. But quickly the resolve evaporates in the looming cloud of suspicion, because logic and transparency go hand in hand, and in the absence of one, the other cannot be sustained. Great kudos to Director, Phillips and the entire creative team, to production manager, Ron Gasparinetti and Executive Artistic Director, Lisa Mallette, for bringing such timely and bold productions to San Jose, CityLights. For tickets, please go to www.cltc.org . Ideation will run till February 19, 2017.